The fastest and safest way to travel from Cusco to Machu Picchu is by train. To get a ticket, the most important thing is to book the ticket with days or weeks in advance. For this you must enter the official website of Peru Rail or Inca Rail. After completing your personal information, make the payment online and that’s it! How to book with Peru Rail? How to book with Inca Rail? How to buy train tickets in Cusco (Peru)? What is the time of the train tickets? How long before booking the train ticket? Are there discounts on the price of the train to Machu Picchu? 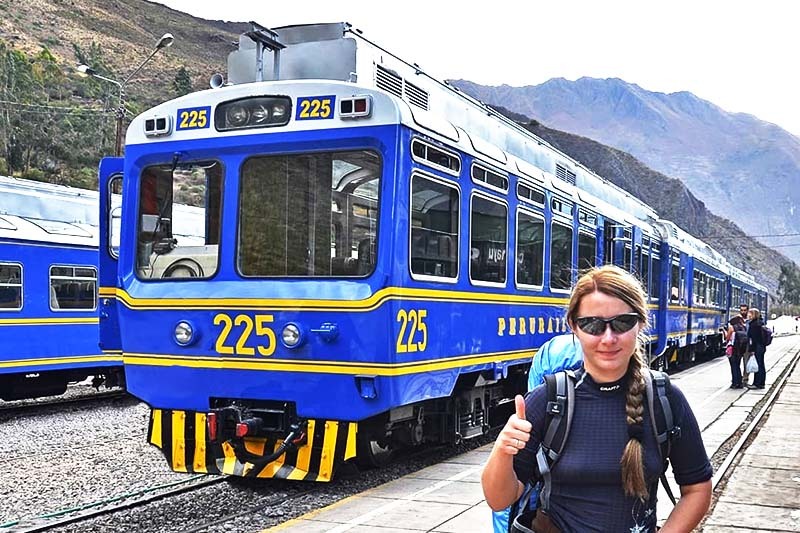 The trains leave for Machu Picchu mainly from 2 stations: Poroy (Cusco) and Ollantaytambo. The trains that depart from the Poroy station in the direction of Aguas Calientes take 3 hours on average. The departure frequency is not as dynamic as in the Ollantaytambo station. Both Peru Rail and Inca Rail trains bring tourists from this station. The trains that depart from the Ollantaytambo station take an average of 2 hours to get to Aguas Calientes. The vast majority of trains depart from this point. The trains headed to Machu Picchu cross the Sacred Valley, one of the most important and sacred places for the Incas several centuries ago. To book a train ticket, you must enter the Peru Rail or Inca Rail website. To get availability, the reservation must be made weeks in advance. Enter the official website of Peru Rail. Complete the spaces with the trip details: ‘destination’, ‘route’, date ‘and number of passengers. At the end, click on ‘Find your train’ . Check availability and choose the train of your choice. Do the same with the train back. Check that the train schedules and prices are correct. Fill in the spaces with your personal information. Check the validity of your personal information as well as the details of the train trip. Select a payment method: PayPal, Visa, MasterCard or a bank transfer. Accept the ‘terms and conditions’ and make the payment. After making the payment, you can print the tickets and present them on the day of your trip. Enter the official website of Inca Rail. Complete the trip information: date of departure, return, number of passengers and currency. Click on ‘Buy tickets’ .. Select a route and check that the train you like has availability. Complete the passenger register with the personal information of each one.. Check the validity of the information. Then select a payment method and complete the requested spaces. Finally, click on ‘Start payment’. After the payment has been made, you only have to print the tickets purchased and present them on the day of the trip ..
You can choose to take trains from stations Poroy (Cusco) or Ollantaytambo. There are also some services that depart from Urubamba. Are you not sure about booking the train ticket online? It is also possible to do it personally in Peru. For this you must buy them directly at the offices authorized by Peru Rail or Inca Rail in Lima and Cusco. Larcomar Shopping Center: Av. Malecón de la Reserva 610, Stand 214 – Plaza Gourmet – Miraflores-Peru. Jorge Chávez International Airport: Av. Elmer Faucett s / n, National Departures, 2nd. Floor (between door 13 and 14) – Callao-Peru. Plaza Norte Shopping Center: Av. Alfredo Mendiola 1400, 1st. Floor (South Gallery) – Lima-Peru. Main Square of the Cusco : Portal de Carnes 214, Main Square-Cusco. Square Regocijo: Square Regocijo 202 – Cusco. Wanchaq Station: Av. Pachacutec s/n, Wanchaq District – Cusco. Poroy Station : Roldan Street s / n, District of Poroy – Cusco. Urubamba Station : Av. Ferrocarril s / n Urubamba, Sacred Valley – Cusco. Ollantaytambo Station: Av. Ferrocarril s / n Ollantaytambo, Sacred Valley – Cusco. Machu Picchu Station: Machu Picchu Pueblo s/n, Barrio Las Orquídeas – Cusco. Main Square: Portal de Panes 105, Main Square-Cusco. Machu Picchu Station: Machu Picchu Train Station Pueblo s / n – Cusco. The price of trains depends on the type of service. Peru Rail offers 4 types of service: ‘Expedition’, ‘Vistadome’, ‘Hiram Bingham luxury train’ and ‘Local train’. Inca Rail offers 3 types of service: ‘Economy Class’, ‘Executive Class’ and ‘First Class’. Train schedules are set by Peru Rail and Inca Rail. Choose the time and service of your preference according to the time and day of your visit to Machu Picchu. Peru Rail ‘Vistadome’ train schedules (Ollantaytambo – Aguas Calientes) ..
Peru Rail ‘Expedition’ train schedules (Ollantaytambo – Aguas Calientes) .. Train schedule Peru Rail ‘Hiram Bingham’ (Poroy (Cusco) – Aguas Calientes) ..
Peru Rail local train schedules (only for Peruvians) (Ollantaytambo – Aguas Calientes) .. Train tickets must be reserved as soon as the date of the visit to Machu Picchu is known. It is recommended to make the purchase one week in advance. If you plan to make the trip during the high season of tourism in Machu Picchu (from April to October), you must separate the tickets one month in advance. During May, June and July it is recommended to book train tickets one month or more in advance. The number of visitors and passengers during those days increases in Cusco and Machu Picchu. By booking the Machu Picchu train ticket online you can secure the ticket in advance. Doing it in person in Peru can cause it to no longer be available. Children from 0 to 2 years old do not pay their train ticket to Machu Picchu as long as they travel in the arms of their parents. Only one child is allowed to carry a load per passenger. Children from 3 to 11 years old pay the price of the ticket with a discount of 50% of the adult rate. Infants (from 0 to 2 years old) do not pay for the train ticket. Children travel on the arms or legs of their father or mother. Only one infant is allowed per adult passenger. Children from 3 to 12 years old pay for the train ticket with a discount of around 50% of the adult price. How to get to Machu Picchu without a train? There are 3 ways to get to Machu Picchu: the Inca Trail, the route through Santa Teresa and the train ride through the Sacred Valley of the Incas. Travel by train is the fastest, safest and most widespread way for tourists to get to Machu Picchu. The train journey crosses beautiful landscapes of the Sacred Valley, an important place for the Incas until reaching Aguas Calientes (Machu Picchu pueblo). But traveling by train is not the only way to reach the Wonder of the World. Inca Trail – 4 days and 3 nights hike through ancient Inca trails to reach Machu Picchu through the Intipunku (Sun Gate), the old gateway to the Wonder of the World during the Incas. Route through Santa Teresa – Alternative route that reaches Machu Picchu through the town of Santa Teresa. First you travel several hours by bus and then you walk for about 3 hours to get to Machu Picchu. Book in advance the entry tickets to Machu Picchu. After knowing the date of the visit to the Wonder of the World, separate the train tickets online. The prices of the train ticket tend to increase if the reservation is made from one day to the next. Make the reservation weeks before and get the best rates. Inca Rail offers a private train service where tourists can travel with their companions in a personal car. Peru Rail has a service called ‘Sacred Valley’, which stops at the hotel Belmond Río Sagrado de Urubamba for its guests to enter the car. For security reasons, the methods of payment of trains to Machu Picchu only accept Visa and MasterCard with security code. The best alternative is to pay with PayPal. The trains only allow a baggage no more than 5 kilos per person. Carry only what is necessary. If not, request more luggage space with train services. Remember that if you do not enter the train at the scheduled time, you will lose the trip without the right to a refund.